When you go to a Parisian bistro for lunch or dinner, one of dishes you will find on the menu quite frequently is la terrine maison. These home made terrines are mostly made of chicken or poultry liver and served with pickles and bread as a starter. At home, we love to have it along with other charcuterie, such as pâté en croute, as a whole meal from time to time – but only when we´re not that hungry. Then the terrine you see in the photos will be enough for two (otherwise it serves 4-6 as a starter). I found a very doable method by Stéphane Reynaud I used for this recipe: All you need is a a sharp knife, hand mixer and a frying pan, the rest is very easy. Rinse livers under cold water and pat dry with kitchen paper. Gently remove larger vessels with a sharp knife (or ask your butcher to do this for you). Brown chopped onion and garlic in olive oil for 1-2 minutes, add livers, juniper berries, chopped duck breast, thyme leaflets and cinnamon and fry for another couple of minutes, until livers are cooked through. Deglaze with cognac, stir well and reduce to a syrupy, glossy consistence. Off the heat, stir in 75 g of the butter, season with just a little salt and pepper. Transfer mixture to a high sided, shallow bowl and purée with a hand mixer (or use your kitchen machine). Add a tbsp of crème fraîche for an even smoother consistence, if desired. Fill in a terrine dish, and leave to cool in the refrigerator. After about 30 minutes, cover the surface with the remaining butter (melted), decorate with a little thyme and piment d´esplette. If you don´t have piment d´esplette, a dash of cinnamon and ground pepper looks nice, too. Allow to sit for at least 2 hours in the refrigerator. Serve with pickles and bread of your choice. I´d recommend to store the terrine no longer than 2-3 days, refrigerated. Geht man in ein Pariser Bistro zum Essen, gibt es einige Gerichte, die sich mit einiger Sicherheit auf den meisten Speisekarte finden, darunter die terrine maison. Typischerweise besteht diese Terrine nach Art des Hauses aus Hühner- oder Geflügelleber und wird mit Cornichons und Brot als Vorspeise serviert. Ist der Hunger nicht allzu groß, reicht uns die unten angegebene Menge mit einer ordentlichen Ration Baguette auch für zwei Personen als kaltes Abend- oder Mittagessen (sonst für 4-6 als Vorspeise). Ich habe ein ganz einfaches Rezept bei Stéphane Reynaud (in dem Kochbuch Ripailles) gefunden und als Grundlage für diese Terrine verwendet. Es läßt sich sehr schnell zubereiten, und dazu sind nicht einmal besondere Küchengeräte erforderlich – ein scharfes Messer, eine Bratpfanne und ein Mixer oder Pürierstab sind alles, was man braucht. Lebern unter kaltem Wasser abspülen und trocken tupfen. Größere Blutgefäße mit einem charfen Messer vorsichtig entfernen oder küchenfertig vom Metzger vorbereiten lassen. Zwiebel und Knoblauch in Olivenöl anschwitzen, nach 1-2 Minuten Lebern, Wacholderbeeren, Entenbrust (in Streifen geschnitten), Thymianblättchen und Zimt zugeben und ein paar Minuten weiterbraten, bis die Lebern durch sind (ca. 6-7 Minuten). Mit Cognac ablöschen, sirupartig einkochen lassen. Vom Herd nehmen und 75 g Butter in die heiße Mischung rühren, leicht salzen und pfeffern. Alles in ein hohes, schmales Gefäß umfüllen und pürieren. Ggf. einen TL Crème fraîche unterziehen. In eine Terrinenform umfüllen und kühlen. Nach ca. 30 Minuten die Terrine mit der restlichen Butter (zerlassen) abdecken und eventuell mit einer Prise Piment d´esplette und einem Thymianzweiglein verzieren. Alternativ tut es auch etwas gemahlener Pfeffer und eine weitere Prise Zimt. Mindestens weitere 2 Stunden im Kühlschrank durchziehen lassen und mit Cornichons servieren. Innerhalb von 2-3 Tagen aufbrauchen. You´re never too young to love pickles! 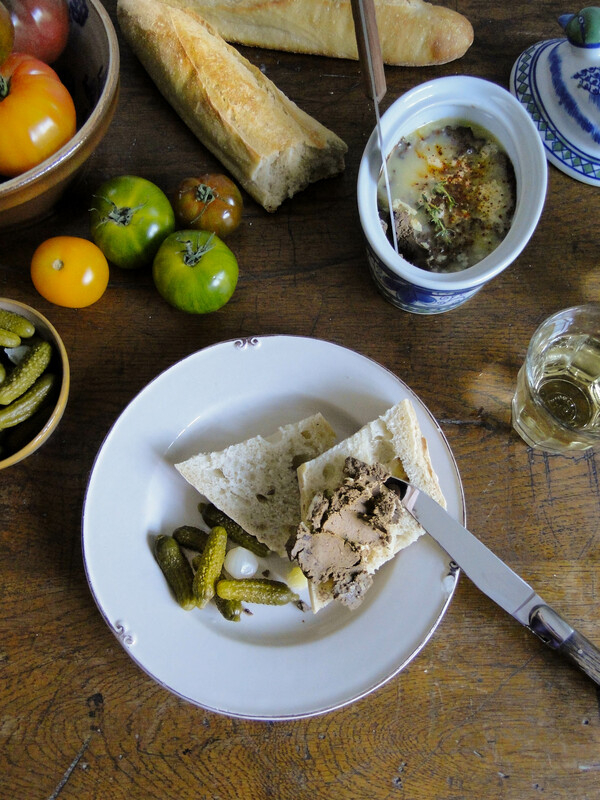 I love “terrine a la maison” and always bring some back when I return from France. Your recipe looks easy enough to reproduce, thank you. What a previous child Sabine and with a mother like you it is no wonder that she loves pickles. What a fabulous lunch, Sabine! It would make a great appetizer too! Your duck casserole is so so pretty! Thanks, dear Francesca – it´s a special casserole from a lady who once gave it as a present to my mum. I only use it for special dishes…! We´re kindred spirits, it seems, when it comes to terrines , Nicole! The method is genius, easy and quick, the result is really satisfying (if one loves liver terrines )!! This looks so easy and so good. Can’t wait to try it. Thank you, Nadia! I would love you to try! I love a good terrine and don’t make it often enough. Must have cornichon too! Yes please! I love terrines and pâtés so much, can´t wait to try some more recipes ! Have a lovely weekend, Sabine. So exciting to discover you!! I love cooking, too, so this journey will be fun in more than one way! So glad to meet a kindred spirit when it comes to cooking! Nice images. Cute little helper. Thank you! Hope she´ll be my apprentice soon! Très apetissant terrine Sabine, et l’accompagnement que tu proposes il ne pourrait pas être mieux ! Il faudra que je me lance un de ces jours ! J’ai toujours pensée que c’était trop difficile. Mes enfants aussi adorent les cornichons ! C´est très vite et facile , cette recette! C´est pourquoi je ´ai choisie, Eva. Merci et très bonne journée, Sabine! I´m glad you like the recipe, Anne – thank you very much for stopping by! This is gorgeous! Very similar to a recipe of my mother’s I’ve always used, except for the bacon and creme fraiche. I’ll have to try yours when the darn weather cools down! Bonjour Mimi, you remind me of my own plans for making pâtés and terrines again – we´ll have much time for this as soon as it´s getting grey and cold! I´m so glad you like that recipe!